Are your drive-thrus performing up to your expectations? A professional assessment could improve performance. For excellence in drive-thru service, depend on leading edge products. We provide superior drive-thru design and installation services. We cover all the bases from design to installation to traffic pattern flow. 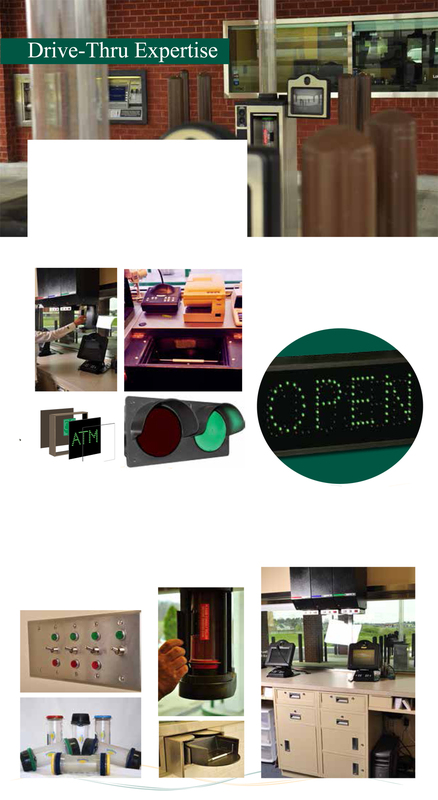 We offer the best-in-class in Drive-Thru ATM and Pneumatic Tube Systems. For traffic management, we offer eco-friendly bollards and ATM Drive-Thru signs. Our lane lights use the super-green LED technologies which cut energy use, and can last years with no maintenance. We offer Drive-Thru Audio and Video systems to increase efficiency and enhance security. We design and install well-equipped and easy to manage drive-thru teller stations. Choose from a wide selection of dependable pneumatic systems and drive-thru transaction drawers. We offer the full range of supplies for your drive-thru systems including double-end opening and sideopening drive-thru carriers.